Over 530 working discount & coupon codes are active! Everyone loves receiving a beautifully packaged gift, especially during the festive holiday season. It’s even better when that beautiful packaging isn’t made from chemicals and dyes that can harm the environment once discarded. In the interest of greener living, we’ve put together some ideas for environmentally friendly gift wrapping strategies and techniques during the holidays. It’ never too late to wrap a present: it can be done quickly and easily using the methods below. In case you’re rushing to find the perfect present as well, be sure to check out our gift ideas under $20, $30, $50 and $100. 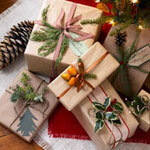 Recycling is the best and easiest strategy for gift wrapping without harming the environment. First check around the house (especially the recycling bin) for paper and other materials that can be cut up, re-shaped and transformed into wrapping material. While wrapping gifts in newspapers have received some bad rep in the past for being a cheap, this clever idea seems to be making a comeback as long as it’s done tastefully (such as in the picture at the top of this post). Depending on the person’s hobbies and interests, you can also wrap gifts in pages from their favorite journals, magazines, or even music sheets. Pay particular attention as you shop throughout the year as some purchases come in interesting packages. From unique gift boxes to brightly colored shopping bags, it’s all available to be re-used as gift wrapping during the holidays. Save these when you get them – sometimes it only takes an extra touch or two to liven them up. Reduce the amount of wrapping and accessories used on presents by eliminating tape. Simply fold the edges as tightly as possible and secure the wrapping with natural yarn or anything else you may have handy. If you’re like me and you can’t wrap presents nicely no matter how hard you try, then use eco-friendly tape constructed from recycled materials to help reduce the amount of waste in landfills. The best way to reduce wrapping material waste is to not have any in the first place. Consider the type of gift and try think of an accompanying gift that can enclose it. For example, scarves and bath towels can be used to wrap just about any kind of gift, while kitchen supplies can be delivered in a large mixing bowl or stockpot. For scarves, simply tie diagonal ends together and then tie the remaining 2 ends on top for the same effect as the picture on the left. Take a look at the following how-to scarf gift wrap for more details. Alternatively, I also found this useful video of the Furoshiki gift wrapping method, which is a traditional Japanese way for wrapping anything from 2 items in 1, to bottles, and even boxes. If someone is going on a trip soon, try wrapping their gift in a map of the city or country where they’re going. Maps are visually interesting, and useful to boot. Perhaps after reading our tips for baking on a dime, you decided to bake something delicious to give as a present? Place it in a glass sauce or jam jar from your local store. Select one with a lid big enough to fit your present, then remove the label and any sticky residue with alcohol. Drop a little paint into the bottom of the jar, and swirl around so the paint covers the bottom and sides. After letting it dry, set the gift inside, and admire your truly unique-looking baking gift. Some of the best and most environmentally friendly gift wrapping ideas can be found right outside your window. There are all kinds of branches, evergreen, herb sprigs, flowers, pine cones, and other natural materials just waiting to be picked up and used. Be sure to dry whatever you pick up first with either a blow dryer or by letting it sit for a couple of hours. This is an especially great trip for those that live in colder climates or even rainy ones. Though you won’t find these in your backyard, you can also buy winter berries and cinnamon sticks on the cheap to decorate your presents. Bows and other shiny embellishments often contain man-made materials that are difficult to break down. Do the environment a favor and get rid of them altogether. Use crayons, pens, or markers to spice up any recycled paper you have lying around. Better yet, enlist a child to help. This will add a festive, personal touch while also aiding the environment. Do you wrap gifts in an eco-friendly way? Share with us below your tips and tricks for gift-wrapping.